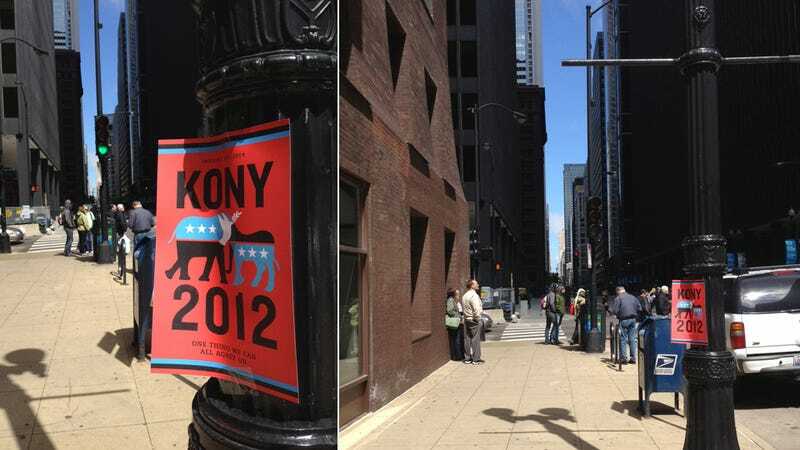 So How Did the Kony 2012 Poster Party Go? Soooo...what did you guys do last night? It was April 20th and there were so many options: get baked, celebrate Hitler's birthday, celebrate my mom's birthday, plaster the town with all those Kony 2012 posters you bought after you watched some viral video... You probably didn't engage in that last activity (and I'm certainly hoping you didn't have cake and ice cream for der Führer), but if you did, it's because it was Invisible Children's "Cover the Night" event. Per the plan outlined in the mega-viral Kony 2012 video, last night you were supposed to open those "action kits" you ordered after being moved by the campaign's powerful imagery, and you were going to hang up some fliers in a well-meaning but misguided effort to bring brutal African warlord Joseph Kony to justice. Once all the streets were plastered with these posters — posters everywhere! — Joseph Kony would be the most famous man in the world and some unnamed international justice warriors would have to take him down. Cover the Night, and the world will no longer be able to look away. But you forgot, didn't you? You didn't even make a note of it in your Franklin Planner, am I right? I'm just guessing, because I didn't see any fliers in your neighborhood. Sure, some kids in Seattle remembered, but that's Seattle. (And probably Portland. I bet they remembered in Portland.) But what about you? Did you hang a poster? Have you seen any today? A tipster sent us a lone flier sighting from downtown Chicago. At least that person remembered.